I’ve always enjoyed collecting artifacts connected to the building’s that I’ve photographed and/or researched. I tend to favor paper items, such as brochures. But physical objects have a charm all their own. 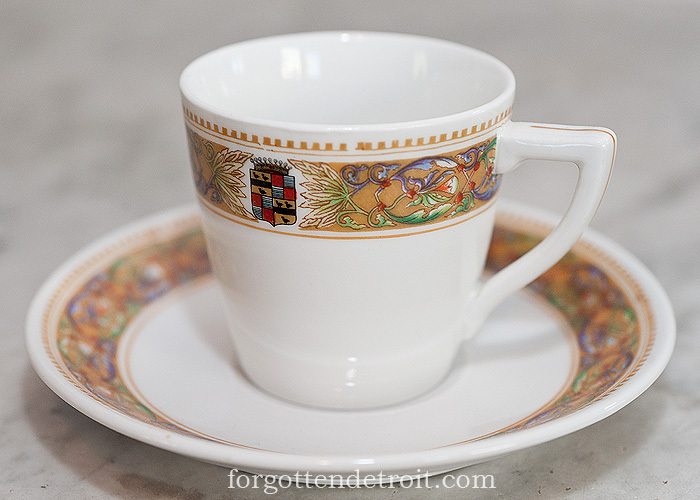 My greatest collection, hands down, are my prized china pieces from the Book-Cadillac Hotel. Once you get one, you can’t stop. They are especially meaningful since the hotel’s original interiors are long gone. These elegant pieces, which were designed to match the rooms they were used in, survive as reminders of the hotel that was. They are echos of something lost. As luck would have it, the writers of the special January 1925 issue of The Hotel Bulletin dedicated to the Book-Cadillac included descriptions of the hotel’s china service. Thus I have a period source that tells me what patterns existed and how they were used by the hotel. They run the range from fairly utilitarian to wildly ornate, and from basic restaurant ware to pieces that still leave me baffled. By now I have more pieces than I care to count, with all of the hotel’s original patterns represented in the collection. I’ve decided that the best approach is to break up my collection into multiple posts based on patterns and unique pieces. To start I will pull out some pieces from the hotel’s general restaurant service pattern, since it was the first I obtained. Back in 1999 I stumbled upon a coffee cup in an antique mall in Marshall, Michigan. At that point I didn’t know what Book-Cadillac china looked like. But the hotel’s logo was unmistakable, even when spotted from across the store. This pattern features a light brown band with a purple, blue, green, and red floral design. 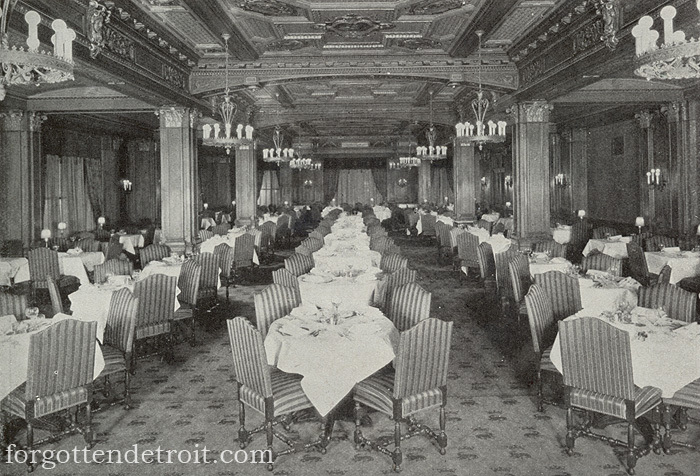 It was used in the Book-Cadillac’s main dining room, the Venetian Room, as well as the Blue Room Café, and for room service, all of which were served by the main kitchen on the second floor. The Venetian Room, seen above, was the hotel’s decorative tour de force. It has my vote as Detroit’s best hotel interior. In fact, my vision of Heaven is enjoying a meal of fine coney dogs with a certain special someone in this room. Sadly, this room was incredibly short-lived and was replaced by an art-moderne nightclub, the Book Casino. That room was cool in its own right, but not quite on the same level. The only trace of the Venetian Room that I found in the late 1990s was some of the marble flooring. Nothing survives today. 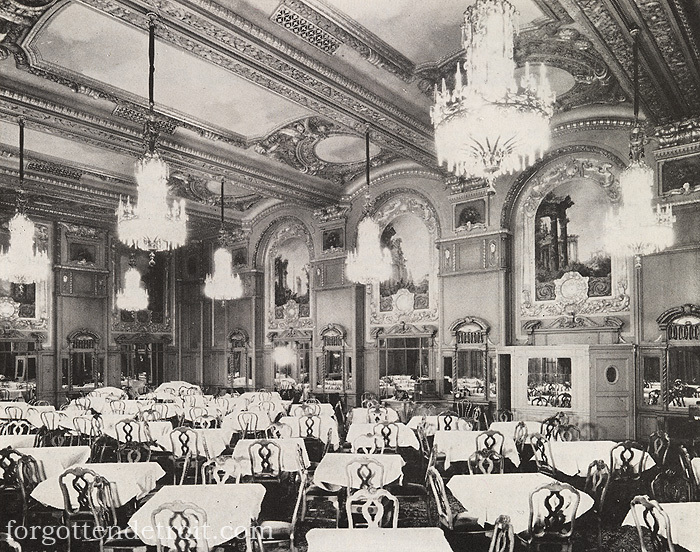 The Blue Room Café was an elegant wood-paneled room at the opposite side of the hotel. The decorative schemes of the two spaces were completely different, so it is interesting that they both used the same china. Like the Venetian Room, the Blue Room went through several redecoratings during the hotel’s life. Yet, by the time I first saw it the ceiling was still intact, barely. Again, nothing remains today. The space no longer exists. The first piece I have here is a charger plate. 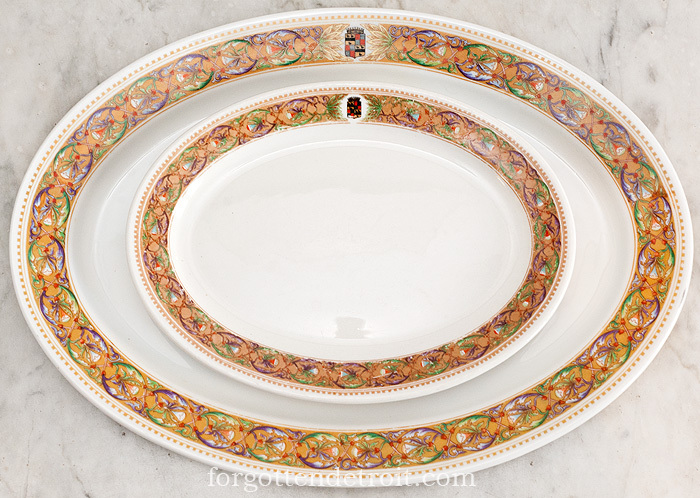 These were large, flat plates that were only used for decoration and not for serving. As a decorative piece, it is the most elaborate example of the pattern. The design of the charger plate is unique. Every other piece of this service has a simplified version of the design. 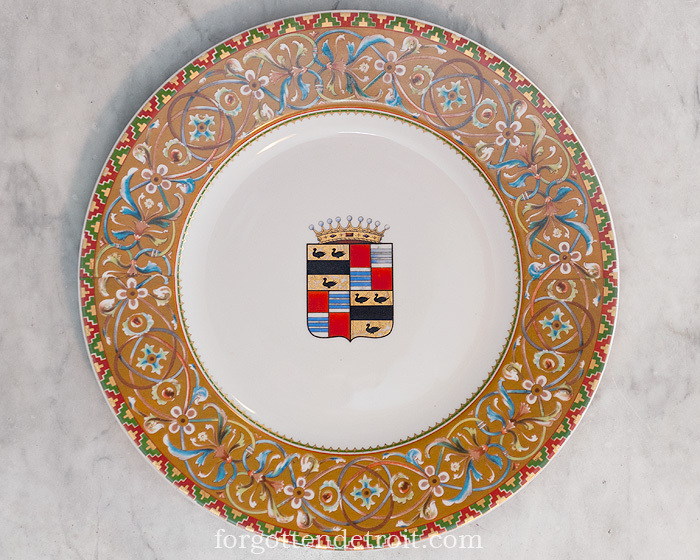 Perhaps the plate’s most striking feature is the large Cadillac crest in the center. It is detailed with gold leaf. Gold leaf is also present in a somewhat Art Deco geometric pattern around the edge of the plate. But the bulk of the design is the aforementioned floral pattern, which is striking to behold. My attempts at photography do not do it justice. Every other piece of this service has a simplified design, seen below. The basics are the same. The main design element is a light brown band with a colorful floral design. But the execution is a definite step down. There is no gold leaf used in the general service, and the Cadillac crest is positioned between two flowers on the band rather than in the center of the piece. Most of the pieces that I have in this pattern are typical service ware. Besides the charger plate, I have a large collection of plates in various sizes, bowls in various sizes, some platters, and cups with saucers. Since they were made for restaurant use, the china is thicker and heavier than typical domestic china as well as heavier than the charger plate. One wonders how many meals these have seen. If plates could talk. Each piece has a back-stamp that provides us with some identifying information. The pattern was German in origin and was manufactured by the Porzellanfabriken Lorenz Hutschenreuther AG Selb. The firm was established in Selb, Bavaria in 1857 by Lorenz Hutschenreuther. But the family’s experience goes back even farther. His father, C.M. 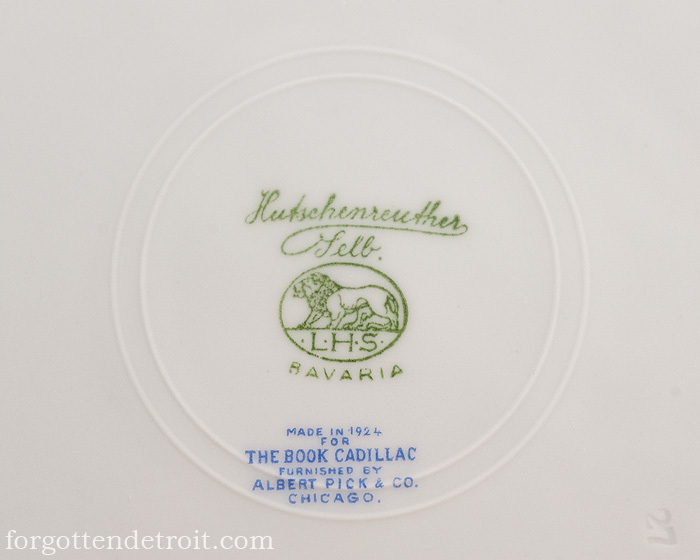 Hutschenreuther, had manufactured porcelain since 1814. The stamp also tells us that the china was furnished to the hotel by the Albert Pick Company. Pick was a hotel supply firm. In many cases the furnishings of a hotel, everything from beds to mechanical equipment, represented a larger investment than the building itself. Pick had the honor, and profits, of furnishing everything needed for the Book-Cadillac. The company has another Detroit connection. It operated the Fort Shelby Hotel from 1951 to 1973. These stamps also give a manufacturing date. Most pieces have dates ranging from 1924, the original stock, to the late 1920s. Obviously it was necessary to reorder pieces from time to time due to kitchen accidents. Just thinking about all of those broken dishes makes me shutter. It appears that by the 1930s the hotel changed its source. 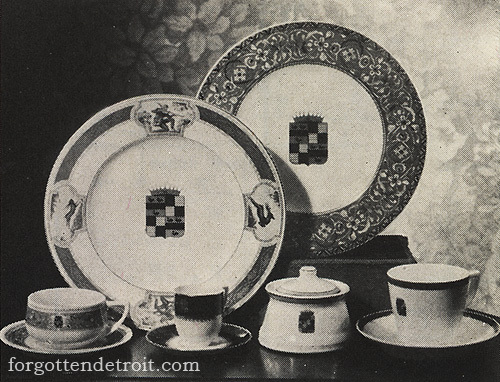 Later pieces are stamped by Lamberton Scammell, a popular American manufacturer of restaurant china. Generally speaking, I find these pieces to be a slightly lower quality than the older ones. But the beauty is the same. The above description and photos only cover a small sampling of both what I own and what was made in this design. Perhaps I will revisit it someday. But in the future be on the lookout for additional posts on the Book-Cadillac’s other patterns. One of the advantages of this hotel is that there are so many unique and beautiful designs. I may never run out of new pieces to showcase. One of my favorite blogs David. You allow us to know the Book Cadillac for the elegant lady she was… At least that’s how I imagine her. These physical pieces of history are pieces of her spirit. Thank you. Thank you for this great blog. I have quite a collection and have had a facination with all of the Detroit Hotels also, especially the Book Cadillac. I found an 18 inch platter in excellent condition at a garage sale in Zanesville. 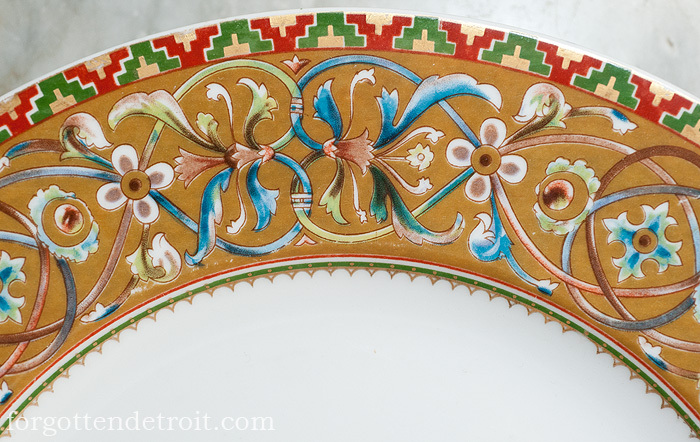 I just liked it & did some Internet snooping & found out a lot of info on The Book Cadillac Hotel in Detroit & it’s dishes; however, couldn’t find the exact pattern until I came across your blog. There you had a pic of the pattern: It has a light brown band around the edge with a floral pattern & the Cadillac Crest between 2 flowers on each side. I understand, from what you say, it is general service – no gold leaf. It is such a nice, well preserved platter. What would you say it is worth? 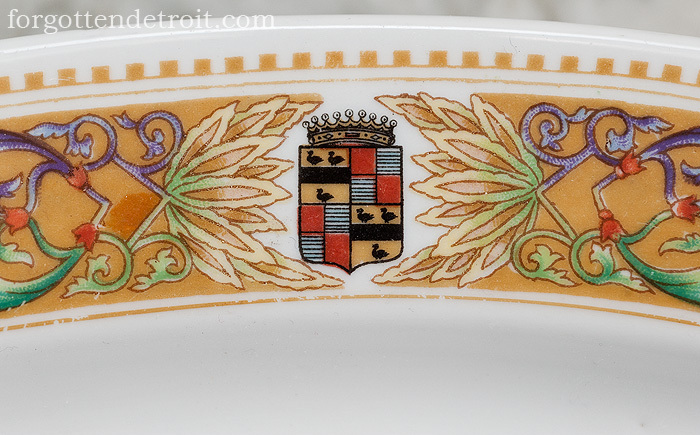 On the back, it does have Royal Bavarian Hutschenreuther Selb made in 1924 for The Book Cadillac furnished by Albert Pick and Company Chicago. Just wondering what a good deal I received. Thanks for all the info! E-mail me if you can & thanks again. It is much less ornate than the gorgeous pieces you have published; it is simple and elegant. It is white with a 1″ deep blue stripe around the border, with a gold rime and a delicate gold border inside. There is a gold Cadillac crest as well. If this is of interest to you, please let me know. The pattern you describe was a special banquet service used for small private functions. I have a few pieces, but if you have something I don’t have I would certainly be interested. 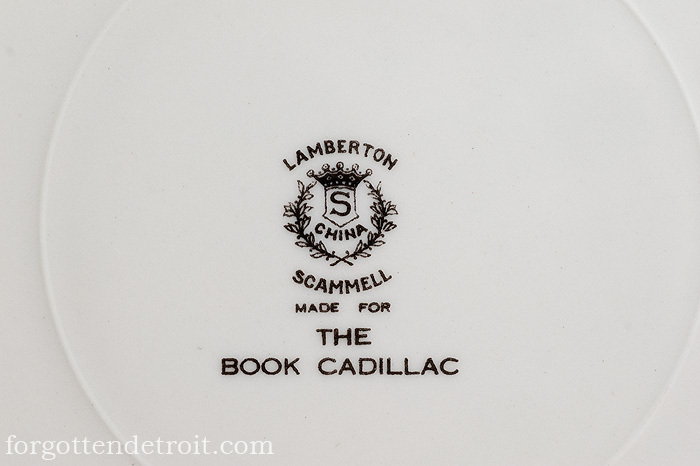 We grew up with this china …my mother’s father , frank p book built the book building & the book cadillac . The depression hit and he lost it all having to pay creditors . I gave my only piece ( a plate ) to a woman i met in eisenhower hospital whose husband had just died. They had married at the book cadillac during its hayday. How ironic , the family has little of what others value so much . Nice to know people haven’t given up on the days of grace and charm. Ps…i’d love to hear from anyone who knew my papa. I found several dishes with the markings above. Is has a hunter and deer pattern. Very nice. I found several dishes with the markings above. Is has a hunter and deer pattern. Very nice. What do u know about this pattern? As you may already know this pattern was designed by J.E. Phillips and patented in 1925 ( USD66,982) The patent was assigned to Albert Pick & Company, which allowed them to select the china companies that would make it. The ‘Robin Hood’ pattern was also designed by Phillips & patented ( 66,983). I can send you copies of the patents, if you are interested, or you can get them off the Patent office site.